It seems strange to say now, but back in the early 90s Nike were a small fish in a big pond. There were certainly signs of promise in the boot world, with the entire European Cup winning Aston Villa team of 1982 wearing Nike footwear. But when it came to kits, they were at the opposite end of the spectrum to adidas. Come Italia ‘90, the brand was nowhere to be seen from a shirt perspective. But following that tournament, which saw two adidas teams facing off against each other in the final (West Germany and Argentina), things began to change. One club which embodied this power shift was Borussia Dortmund. There are few colour schemes more iconic than the yellow and black of Der BVB, and the change in shirt manufacturing contract from adidas to Nike in 1990 represented a major coup for the Swoosh. Dortmund had in many ways struggled on the pitch through the 80s, but a DFB-Pokal win in 1989 would prove to be the catalyst for a remarkable rise in later years. Nike had come on board at the perfect time. From the start they made their intentions clear. All their design efforts were focused on one particular part of the shirt: the sleeves. Nike were notable in creating looks which let the middle of the shirt breath, whilst in contrast letting their hair down on either arm of the kit. adidas had dabbled in this approach themselves, with wonderful kits like Colombia 1990 showing the potential of such a direction. 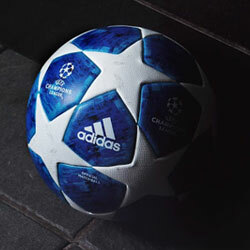 But it was Nike who stretched the field with what they were doing with clubs like Dortmund. If the 1990-91 home shirt was a taste of things to come (with a bold angular shape on either sleeve, producing a star effect), 1991-92 saw a design which combined both blocks of colour and a scattered, sporadic pattern. Things only got crazier the following year, with a sleeve design that looked almost pixelated. An element of randomness was also retained, showing that there was a lot more out there than just clean-cut geometric patterns. No one did it better than Dortmund in the 90s. Image from Wikipedia. Because most of the action was happening on the arms of the shirt, Nike’s early 90s kits managed to remain grounded. This wasn’t simply a case of kit makers being as crazy as possible to create something garrish, this was experimentation in a refreshing way. Another key Dortmund shirt arrived in the 1994-95 season. That particular pattern featured a design which, when both arms were lifted, gave the impression of an eagle fanning its wings. The rest of the shirt was relatively vanilla, but the arms had a certain energy to them. 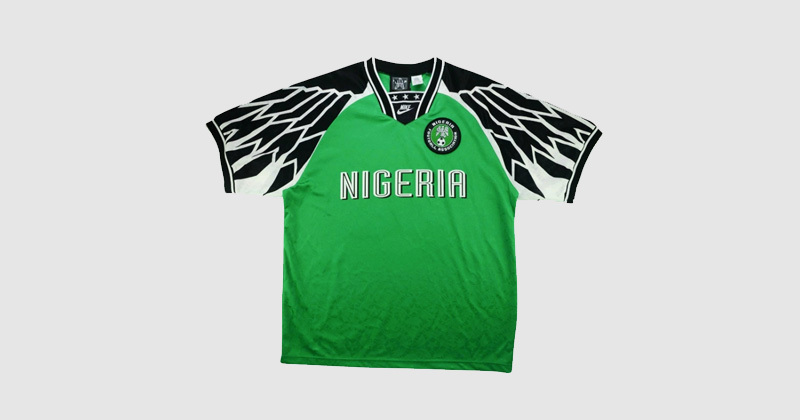 At the same time, Nike would produce shirts for Nigeria in the same design, which made complete sense given the team’s nickname the Super Eagles. The viral 2018 shirt in many ways began with this 1994 shirt. Image from Football Shirt Culture. Over 20 years later this exact template would prove to be one of the primary inspirations behind the 2018 Nigeria home shirt. Alongside Dortmund, another club whose shirts tell a similar story are PSG. A relatively barren spell in the 80s coincided with a switch from adidas to Nike in 1989, an eerily similar tale to their aforementioned German brothers. Les Parisiens proceeded to turn out in a series of beautiful kits. Two examples jump out immediately. 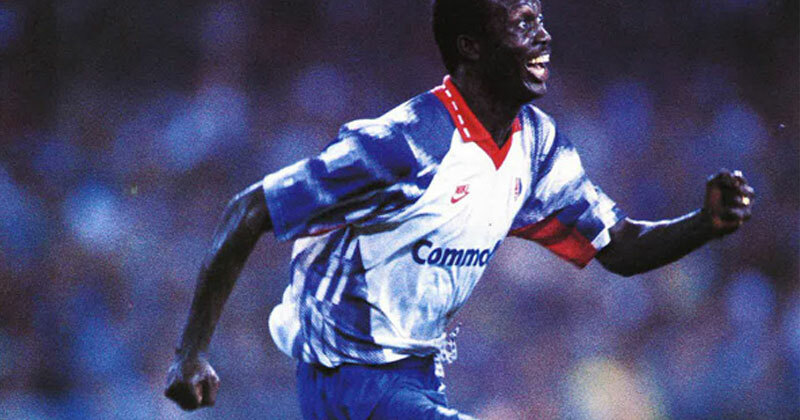 In 1990-91, PSG’s home shirt boasted an Eiffel Tower inspired motif which ran from shoulder to chest. 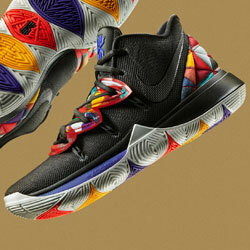 It was such a popular design that Nike simply tweaked the same look for the following season. Then in 1992-93, PSG’s away shirt shared the same template as Dortmund to stunning effect. This design looked just as good for PSG, if not better,than Dortmund. Image from Wikipedia. 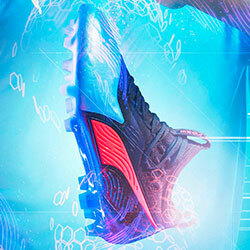 Suddenly there was a serious challenger approaching adidas. It was still early days for the rivalry (Nike would be absent from the World Cup once again in 1994), but Nike were serious about their position in the shirt industry and making waves accordingly. Building on their success with Dortmund and PSG, the biggest switch of all was just about to happen. In 1994, Arsenal transitioned from adidas to Nike in a move which would shape the English game for the rest of the 90s and beyond. The Gunners were an exciting blend of youth and experience at the time. Club record signing Ian Wright was one of the hottest prospects in football, ably supported by the likes of Paul Merson who was in the thick of his long and successful time in North London. Alongside them both was Alan Smith who was soon to call time on an enviable career. Where the ‘bruised banana’ had failed, Nike’s away shirt for Arsenal in 1994 succeeded. Almost symbolically, the usual away colour choice of yellow was switched to blue. Then, things went up several notches with a subliminal lightning bolt motif adorning the bulk of the shirt. The word “Gunners” split each row of the pattern, stylised in a subtle way so as not to detract from the effect of the lightning, yet giving depth to the shirt when viewed up close. A contrasting light blue collar and sleeve detailing topped things off for a shirt which truly laid down the gauntlet as a challenge to the strong efforts adidas had been producing. 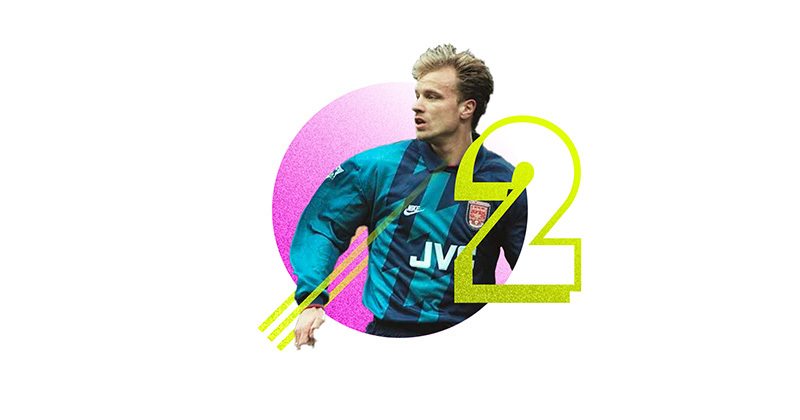 A year later in Dennis Bergkamp’s first year with the club, we saw an evolution of the design with the removal of the “Gunners” text and the lightning bolt brought out in a bigger and bolder way. The light and dark blue combined superbly, and if anything it was even better than its predecessor. 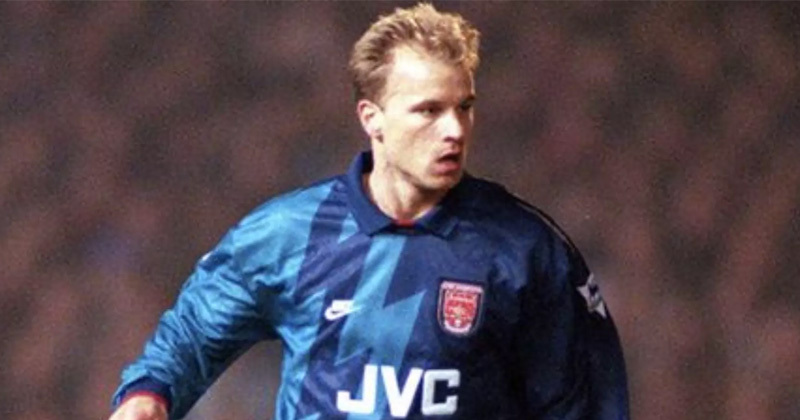 Dennis Bergkamp had quite the shirt career. 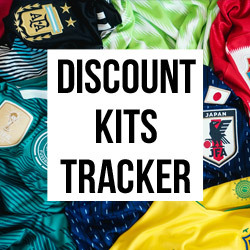 Image from Football Shirt Collective. Nike went from strength to strength with Arsenal, in a relationship that would stretch for a mammoth 20 years. In a similar way, their foothold on the game was about to increase exponentially. With everything that was happening in the early 90s, there was a wonderful sense of innocence. Shirt design was free to explore whichever route it chose to take, leading to the sort of creativity which can only be dreamed of today. It wasn’t as if convention didn’t exist. 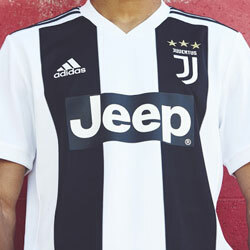 As mentioned previously in Chapter 1, adidas were pioneers in introducing uniformity through their use of the three stripes branding across multiple teams, in a way which didn’t feel overly commercial. But as Nike began to produce kits for more and more higher profile sides, the industry benefited. The football shirt industry hadn’t quite matured yet, and the biggest developments were just around the corner. But when we look back on the 90s we have to smile. There’s a reason so many of the shirts from this time have been brought back this year. We had variety, attention to detail, and the need for brands to separate themselves from the competition in order to make the most of increasingly lucrative sponsorship opportunities. Key moments like the formation of the hyper-commercial Premier League in 1992 only highlighted how serious things were becoming. Before everything got too commercial however, we were served a colourful and flamboyant feast of shirts.